Here in Sweden we’re having a fantastic summer, everything is growing like hell and there is absolutely nowhere left to dig down a bokashi bucket even if you wanted to. We’ve dealt with this somewhat luxury problem by setting up a bottomless barrel right in the middle of the garden bed. Doesn’t look that glamourous I have to admit, but it works brilliantly. The barrel itself is one we used to have in the greenhouse as a water tank until it started leaking. We took a handsaw to the base and plonked the bottom bit on top of the barrel as a lid. With a stone for weight. Obviously there are more elegant solutions but I’m a great fan of just taking the first best thing you find around the yard. Then it’s just to dump the contents of the odd bokashi bucket direct into the barrel. Any excess moisture is quickly taken up by the plants and they just thrive on the nutrition that soaks through. Worms find their way more or less directly and set up shop, so in the summer heat the contents of the barrel just seem to melt away. It’s not so silly to throw in some scrap paper sometimes, toilet paper rolls and cornflake packets, whatever. Gives the worms something to do and helps keep things nice and damp in the barrel. It also helps prevent flies from landing on your food waste and laying eggs, all that we could do without. 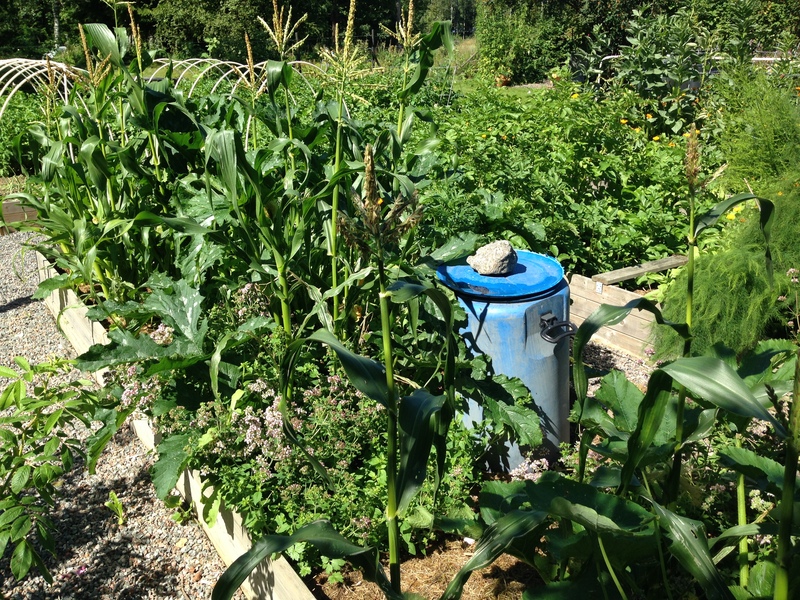 We move the barrel around from year to year, just now it’s landed in a raised bed with corn and zucchini. Probably a bit unfair on the ones further out in the bed as they pretty much miss out but the nearby plants are thriving. Whatever’s left in the barrel when the harvest is taken care of is easy just to spread out and cover with soil. Or, if you are into mulching, it’s often enough just to cover with hay, leaves, garden clippings or whatever. The bokashi microbes work well in combination with the mulch, and even through the nutrition is going to lay around there over the winter it tends to be pretty stable and won’t all just leak away. Of course, you can always just leave the barrel there over the winter, or move it to the next place you want to improve. Here, where we have frozen soil and quite a bit of snow, it’s a wonderfully easy way of taking care of a few bokashi buckets during the winter. A small barrel like this can’t fit so much bokashi in the winter, so you may need a couple more if it’s too cold for any action in the barrel. One idea I’ve heard a few people have tested is to install something similar under fruit trees that could use a bit of a boost. It’s an easy way to feed them up a bit and improve the soil health around their roots, many fruit trees grow year after year without a lot of extra input so chances are they’ll respond well to some attention. Worth testing, in any case! Let us know if you’ve done anything similar and how it went, all ideas are welcome! We have not done like you have done but have problem with rats when we have digged fairly deep among the plants for the bokashi. Have you had any problems with rats with your method? Neat solution. Do you wait until the contents of the barrel are completely gone before you move it to a new spot? Hi Bianca! Sorry about the looong delay in replying, missed your comment altogether. No, I’m not that patient! I just move the barrel when it suits me — either I think that bit of land has got enough nutrition for the time being, or another spot needs the barrel more, or just that I want to change what I’m growing in the first spot. I just lift the barrel, shake out whatever’s in it, then spread it around in the general area. If there’s a lot of unfinished bokashi left I either cover it with mulch or soil or dig it down in a nearby spot. Whatever seems like a good idea at the time basically. But I have to admit, I’ve never seen as many worms in my life as when I empty the barrel! Are you putting fermented waste into this garden bucket or straight from the kitchen and adding bokashi bran? By the way – you seem like a good person to ask – do you know any institutions (schools, cafeterias, camps) doing large scale bokashi? I’m gearing up to start a system that will hopefully manage 20 000 lbs/year and would love to hear more from others experience! Hi Russell! I’m putting fermenented stuff into the barrels. That’s largely due to the climate here in Sweden, there’s such a short period when you could do the whole thing outdoors. In a warmer climate you could test doing the fermentation directly in the barrel. Wish I knew of some good examples for you, I find them on and off but you’d need to spend a long yome trawling through the facebook group to find them. The only guys I can remember offhand are in Montana, Garbage busters/garbage king some such name, sorry my memory is failing me. They are doing a number of large-scale community projects with Bokashi, I really admire their attitude. If you find some good references please share!! Good luck with your projects, it would be really interesting to hear what works and what doesn’t! Mike from Gardens from Garbage was kind enough to speak on the phone with me last week and their systems are quite interesting. They operate outside in quite a cold winter but seem to be using a semi aerobic system as some heat is generated. The way they build new raised beds from layering manure and leaves with fermented biopulp is quite interesting. They do not use animal products in their waste which I imagine might be an issue at least insofar as attracting animals. Previous Entry Drain your scraps before they land in the Bokashi bin!